In the DC metro area, the SAT is the better known of the two college entrance exams, but nationally, more students now take the ACT than the SAT. With colleges accepting both the SAT and the ACT, a natural question to ask is: “how do SAT and ACT scores compare”? Back in 2016, the College Board (the makers of the SAT) released a concordance table that allowed students, families, and educators to equate their SAT score with an ACT score and vice versa. Recently, the College Board and ACT jointly released new concordance tables with updated data from recent test takers. Under the old concordance tables, a score of 36 on the ACT was equivalent to a score of 1600 on the SAT. Logically, that made sense because those are the highest possible scores for each test. 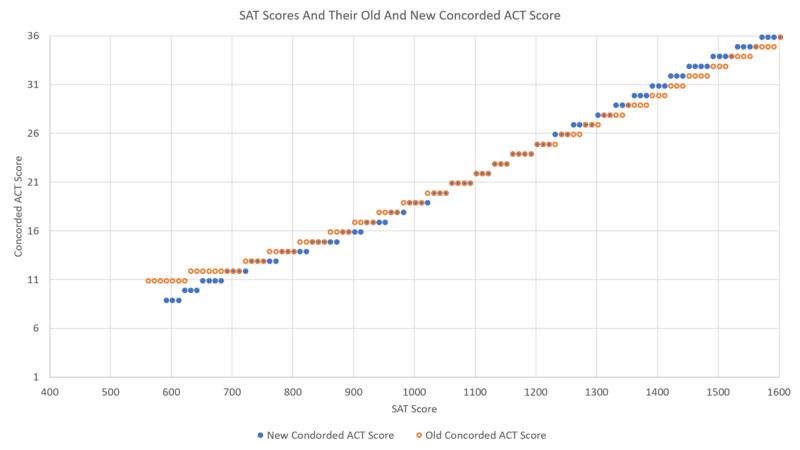 Under the new tables released in 2018, however, a 36 on the ACT is equivalent to the 1570-1600 range of scores on the SAT, with the “most appropriate” score equivalent listed as 1590. When comparing the 2016 and 2018 concordance tables we find that there is a larger discrepancy on the outer ends of the score spectrum than in the middle portion. To illustrate this point, see the chart I made below which plots an SAT score and the old and new concorded ACT score. Blue points with an orange ring remain unchanged between the two tables. For example, a score of 1180 equated to an ACT score of 24 under the 2016 standards and still equates to a 24 under the 2018 standards, while a score of 1470 equated to an ACT score of 32 under the 2016 standards and now equates to an ACT score of 33 under the 2018 standards. A similar trend is true with the lower end of the score range. These updates were announced June 14, 2018 and both the College Board and ACT have updated their websites with the new tables. So what does this mean for students? One of the best things you can do is sit for a full-length practice test of each type and use the updated concordance tables to compare your scores. Educational Connections offers free practice tests, register for one here. If you have any questions or would like to get started with test prep contact us today!